Ghana: the sea touches the country's golden coast in this country of West-African treasury and history. Welcome to Ghana, where drums and dance invite you in, and songs are written about its natural beauty. Ghana is rich in West-African history, and has a melodious music culture and warm-hearted residents that make up the population of 27 million. Attractions include Bojo Beach in Accra, Cape Coast Castle in Cape Coast and Wli Waterfalls in Hohoe. Cheap flights to Ghana are now available for a limited period of time, so get ready to be enticed by this fascinating country! Ghana’s capital city, Accra, is home to Kokota International Airport (ACC), located on a 7-minute drive from the city centre. Kokota International Airport serves a multitude of airlines, including South African Airways, Air France, Emirates, British Airways, Kenya Airways and more. Direct flights depart daily from Johannesburg. The flight duration is approximately 6 hours. Ghana was once the port stop for the trans-Atlantic slave trade route, and still has the scars to show for it, found in the castles along Cape Coast. The warmth of the people, the beat of the Djembe drums in the streets and the fresh, homemade dishes all contribute to what makes Ghana so wonderful. The golden-sanded beaches in the cities of Accra, Beyin and Gomoa Fetteh are the perfect spots for drum lessons and cold glasses of palm wine. Ghana and its magnificent landscapes experience an equatorial climate, which means that most of its days are warm and rather humid. There are two distinct seasons in the country: wet and dry. The wet season (April to September) brings about life and there is plenty of rain, so make sure to bring an umbrella for your trip! During this time you will see the country at its most beautiful, with cascading waterfalls and rivers that are full of life. The dry season (November to March) is wonderful for exploring, and for spotting wildlife at watering holes. If you love a good party, then make sure to visit during the annual Homowo festival season between August and September. An unlikely holiday destination for some, Ghana is filled with unrefined beauty and rich history that spans the entire West African region as it was once the port stop for the trans-Atlantic slave trade route. For a full historical breakdown, visit the sea-side city of Cape Coast. 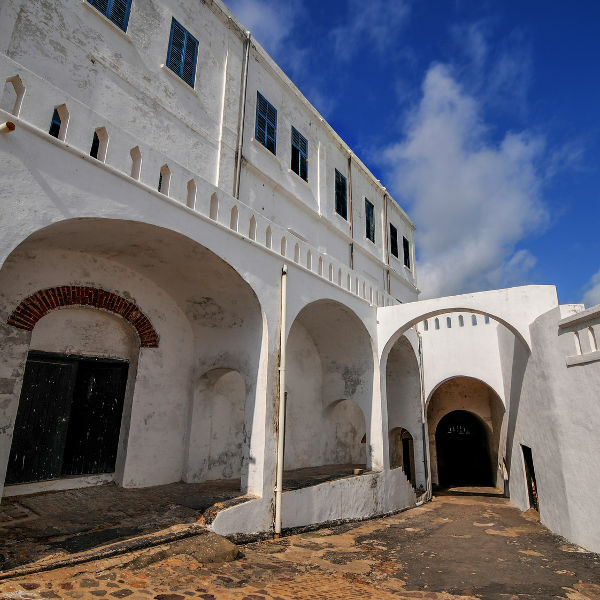 Here you will find the Cape Coast Castle and Elmina Castle – both of which are filled with dungeons, slave vessels, and hidden chambers that were used during the slave trade. In total, there are 32 historical castles along the coast of Ghana. Ghana could easily be described as the rhythmic country of Africa, as no matter where you go, you will find people playing drums and celebrating life through dance. 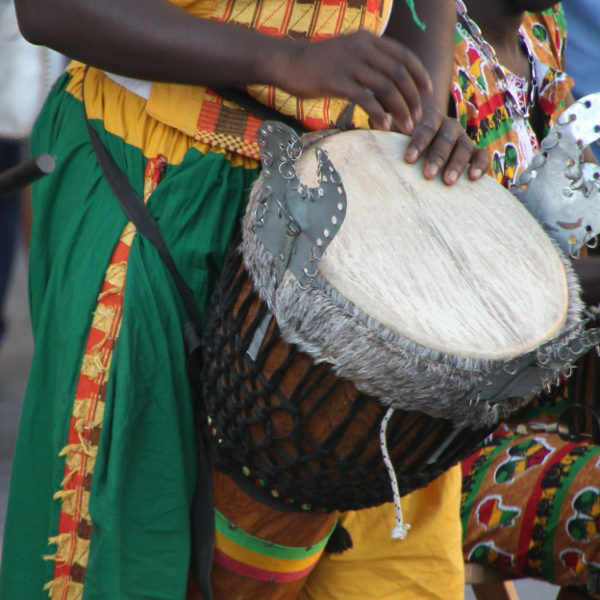 In the capital city of Accra, you can even join a drum class and learn how to play the Djembe drum, and join in on the fun. In the city markets, know that bargaining is a common practice, so prepare to practice your skills as you scout around for souvenirs and trinkets to take home. Ghana loves its country’s land and promotes eco-tourism to preserve its natural resources and landscapes. That said, enjoy some palm wine on the sunny beaches of Labadi Pleaure Beach in Accra. 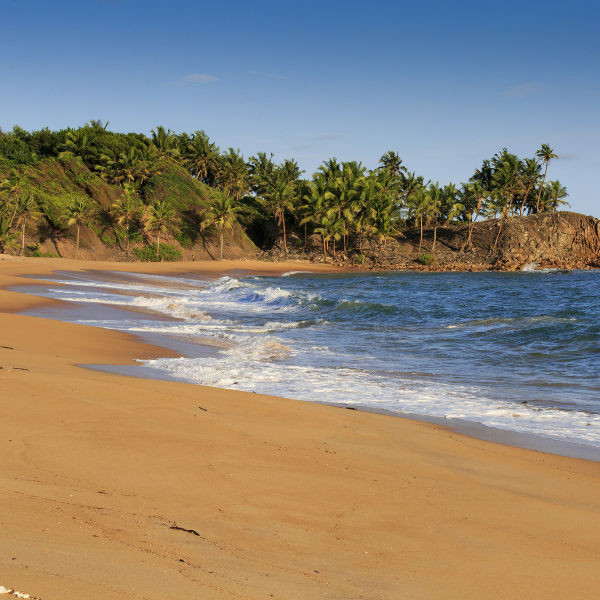 Other popular beaches include those found in the regions of Beyin and Gomoa Fetteh. Compare several airlines, and book your cheap flights to Ghana online with Travelstart! South Africans who wish to visit Ghana will need a visa to do so. You will need to complete an application form, and have the following: a passport that’s valid for a minimum of six months from the day of entry into the country, flight tickets, two passport photographs, proof of accommodation, a letter of invitation and various other documents. Ghana is a safe country to travel through, as long as you remember to use caution and take care to avoid sticky situations. The people of the country are very welcoming, and curious. So, unwanted attention may be a problem if you’re travelling solo. If this makes you uncomfortable then not to worry, as long you are polite, but firm, you will be fine. As in all countries with high poverty levels though, petty crime is an issue in the country. Of course, you can make yourself less of a target by keeping your personal possessions out of sight, not travelling alone after dark and by not wearing any expensive jewellery out on the streets. It is always important to have your vaccines up to date when travelling abroad. When visiting Ghana, it would be a good idea to get a shot for the following: hepatitis A and B, typhoid, malaria and rabies. A yellow fever vaccination card is needed if you’re travelling from an infected area. Please also note that currently, there has been an outbreak of Zika in the state of Ghana and pregnant women are not recommended to travel there. Zika is spread via mosquito bites and unprotected sexual encounters.